The global spike in energy costs has led many to find alternative and sustainable fuel sources. There are many options available today and the fastest growing is the solar energy. Solar power systems derive clean, pure energy from the sun. Solar energy is one of the most widely used renewable energy sources. While many people make the switch to solar for its substantial financial benefits, such as lower utility bills, the environmental benefits are equally important. Solar energy not only produces electricity, it also heats, cools, lights and does countless other jobs. Basically, its potential is limited only by our imagination. One of the most creative ways to use solar energy is represented by solar trees. Inexhaustible and renewable, since it comes from the Sun, solar energy is harnessed using panels and mirrors. Many of us are familiar with solar panel installations with clean, symmetrical designs on the roofs of buildings, but some innovators are seeking out creative ways to harness alternative energy beyond the conventional methods you’ve most likely heard of. Solar trees represent a very inventive way to use solar power, proving that solar is not only practical, it can be beautiful at the same time. A solar powered tree is an energy generator with a visual appearance similar to a tree, with the solar panels serving as its leaves. The solar tree has several advantages as it offers more than just energy output from its panels. Like a real tree, solar trees can offer shade, making them ideal for integration into an open park or property. Like a real tree, solar trees can offer shade, making them ideal for integration into an open park or property. They also solve space problems and can have customizable options to add features in the shade below the panels, such as attached seating or a table. Read on to check out some of our favorite examples of innovative uses of green technology! Unlike wind or tidal energy where you are, in part, dependent on nature cooperating with your energy-collection efforts, there is very little that can hinder your ability to harness the power of the sun. Solar trees can be more than just a way to get rid of dangerous and expensive power lines and even become an aesthetic calling card. Below we’re gonna take a look at some of the most ingenious ways to harness solar energy using solar energy trees. 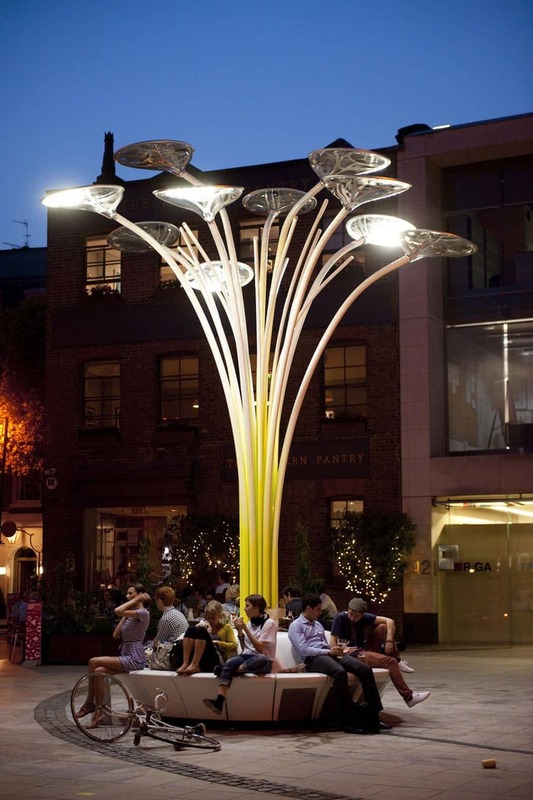 This solar tree is designed by Ross Lovergrove and manufactured by Artemide. The solar powered street lamp combines an innovative design with the technical performances of LED lighting systems using solar energy supplied from the photovoltaic system. The Solar Tree has an embedded artificial intelligence controlling its energy and light. 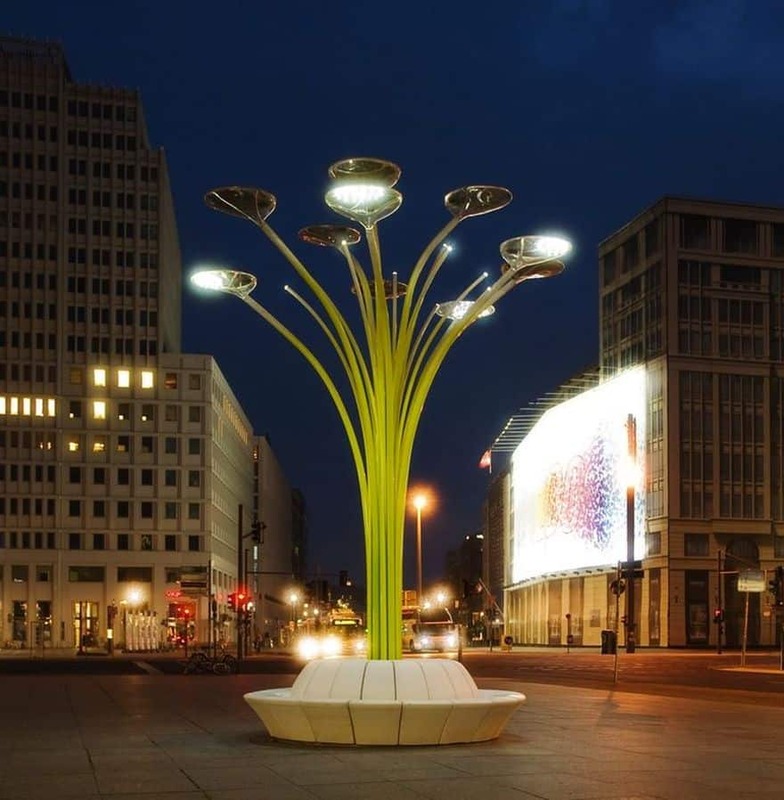 …measuring six meters tall, this solar powered tree adds nature to the urban landscape. Its green trunk has 10 branches which radiate light to the street below. Part public art, part sustainable street-lighting solution, the Solar Tree created by Ross Lovergrove is the proof that solar energy is a truly great thing. …the Solar Tree is also designed to be a landmark and meeting place for visitors, with the sculptured concrete base providing seating for passers-by. 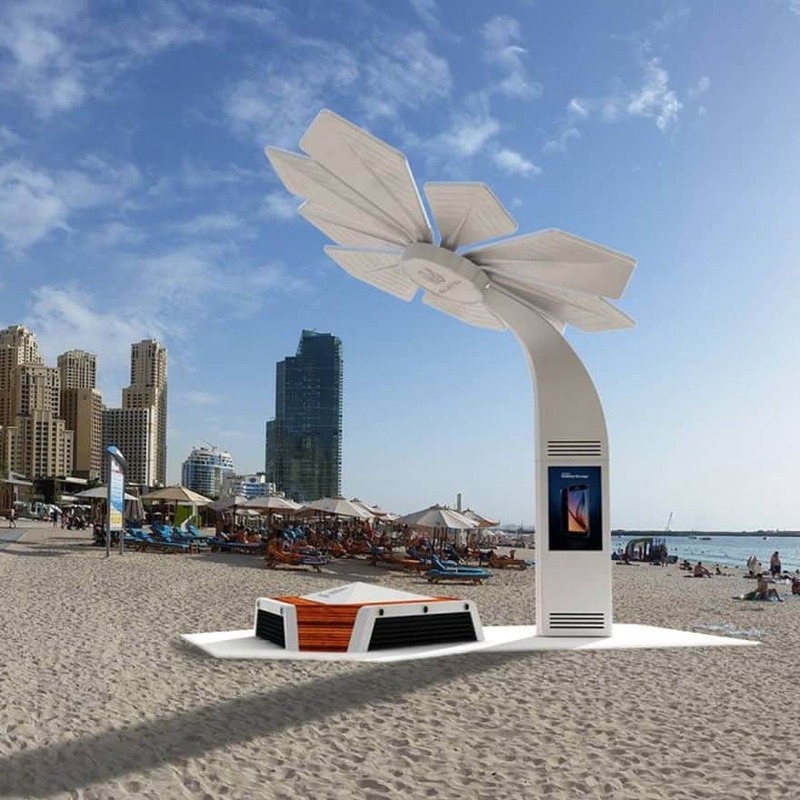 These solar-energy palm trees provide Wi-Fi, charging stations, and much-needed shade. 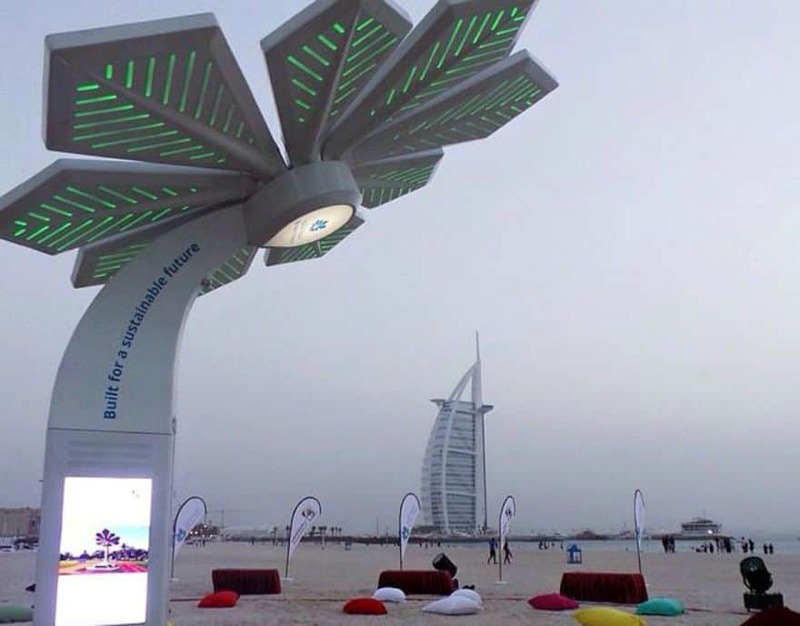 Smart Palm is the company behind this ingenious endeavor and has so far set up more than 50 Smart Palms in Dubai, located on beaches and public areas in the city. Soaking up the sun during the day, these state-of-the-art trees store energy to be discharged in the evening. 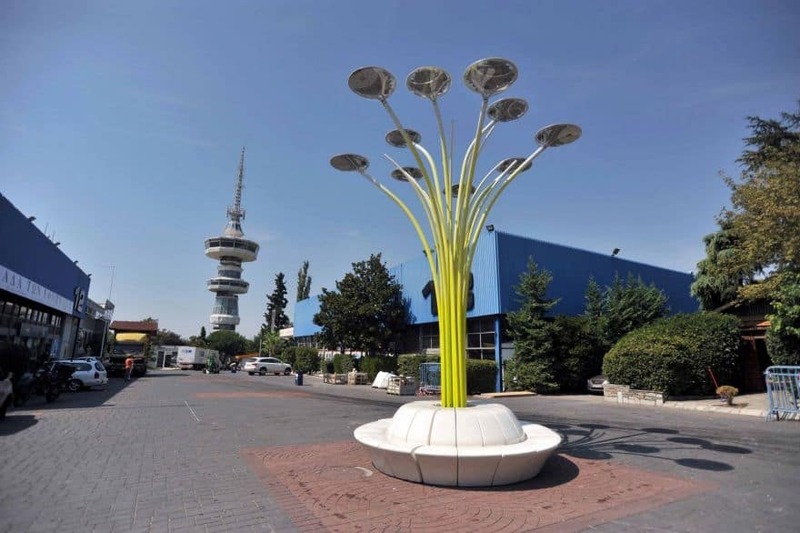 …towering at 20 feet high and with leaves measuring 18 square meters, the solar powered trees give information on the weather, local attractions and have facilities for charging up mobile devices. …the specially designed solar panels, placed on top of the palm leaves power the green light-emitting LEDs that glow impressively at night time. 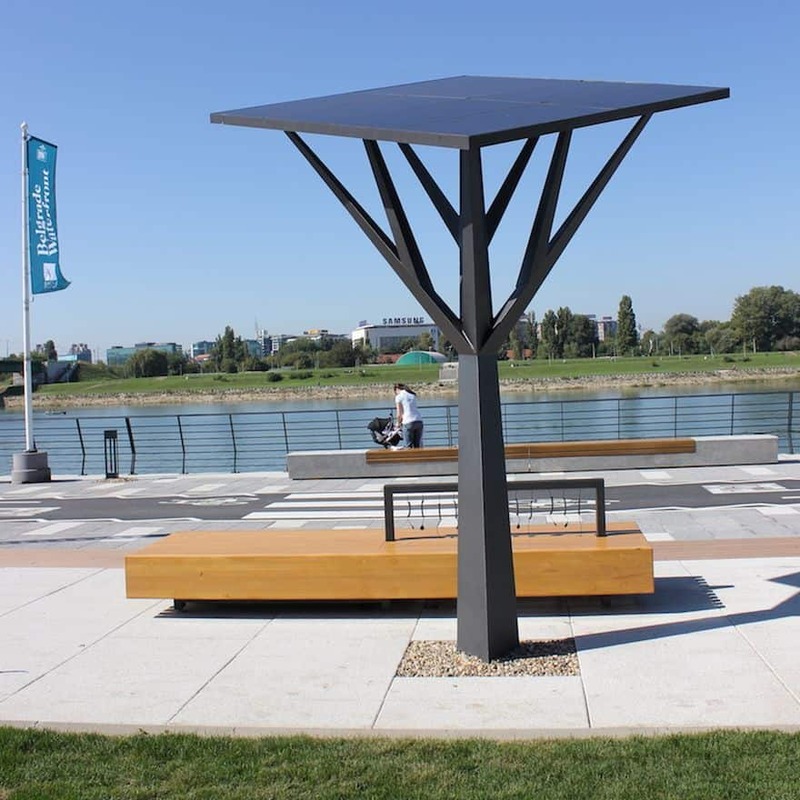 In addition to all technological features, the solar trees also offer seating and shade. 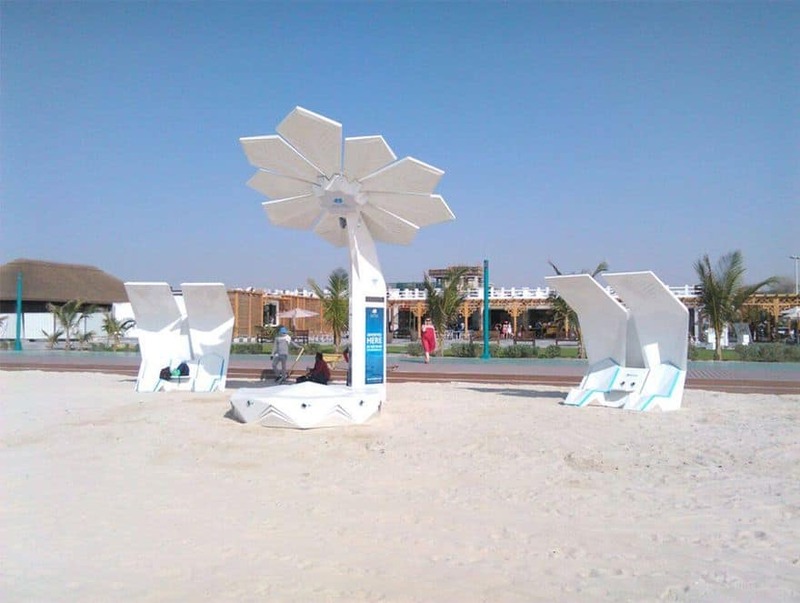 the solar palm trees are independent units that produce green energy and provide a place of comfort and energy for a wide variety of services. 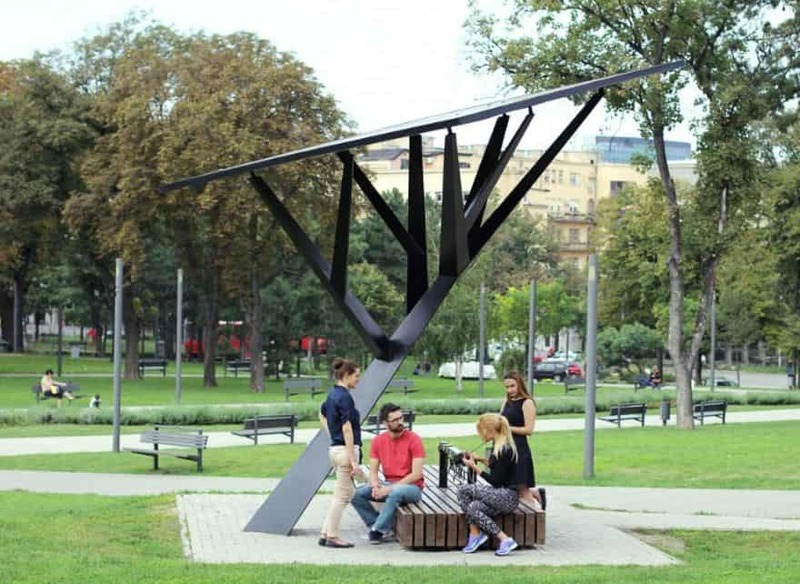 The Strawberry Tree is a public solar charger for mobile devices invented by a group of students from the University of Belgrade. Looking more like an art installation than a public utility, this nature-inspired solar-powered charging station isn’t just about charging phones, though. It aims to raise awareness of energy issues and it’s also a social space, a point where people can gather and chat. 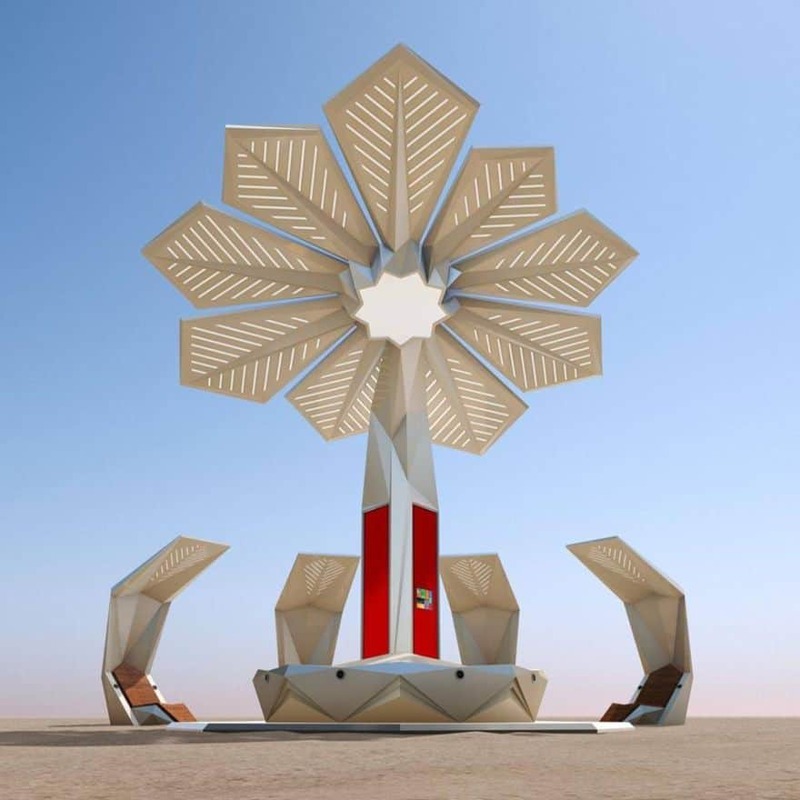 Stylish and practical, these solar energy trees are designed and built to last for decades of sustainable use. …these solar trees come with LED lighting as well as speakers which can be remotely controlled via an app over a Wi-Fi connection. The installation also provides a WiFi hotspot and records environmental sensing data like temperature, humidity, and carbon dioxide and noise levels. The Strawberry Tree is five meters tall and is surrounded by benches. 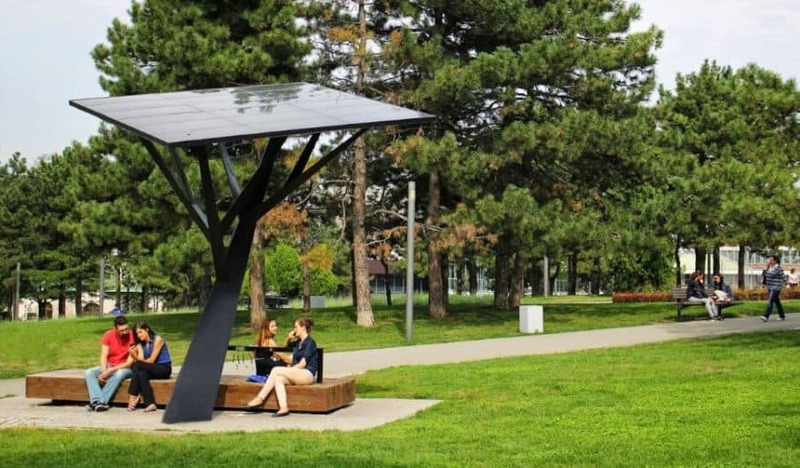 With a large battery capacity that can provide thousands of quick charges, the solar tree can function for up to a month without direct sunlight. 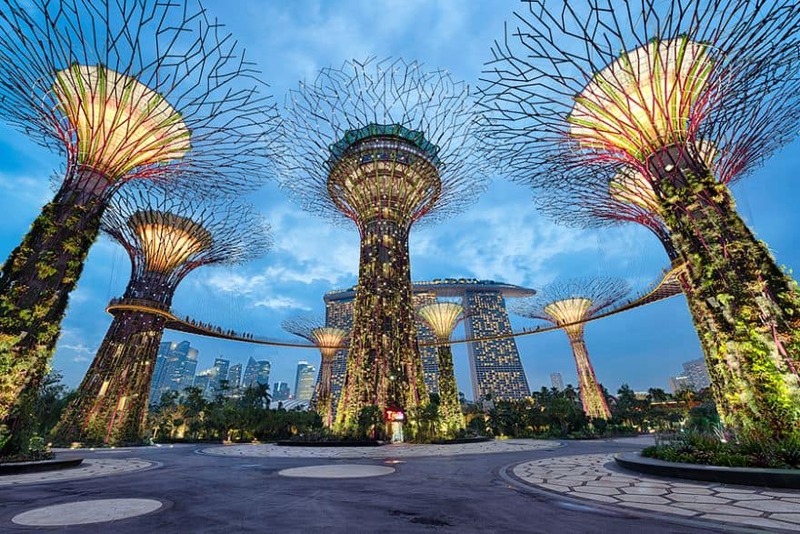 Designed by Grant Associates for Singapore’s largest garden project, the Supertrees are a stunning example of green architecture and are much more than just gigantic tree-shaped edifices. 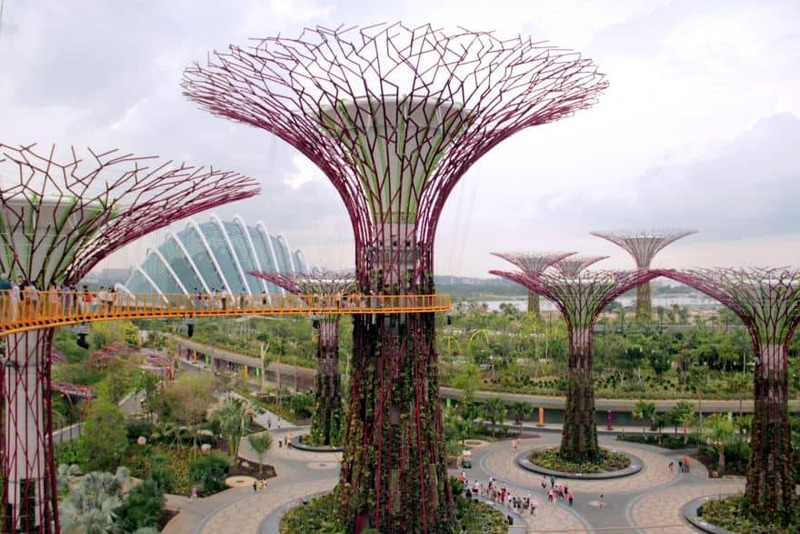 The structures mimic the ecological functions of real trees through their environmentally sustainable features. These solar trees collect rainwater, generate solar power and act as venting ducts for the conservatories. The solar powered trees store solar energy throughout the day – power that’s used to illuminate the garden when the sun goes down each night. 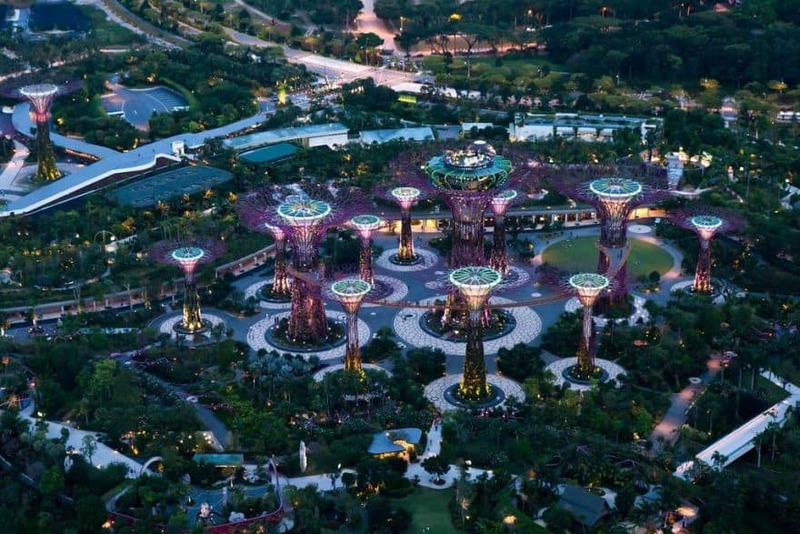 The solar-powered Supertrees look like something out of a sci-fi movie or a digital painting. 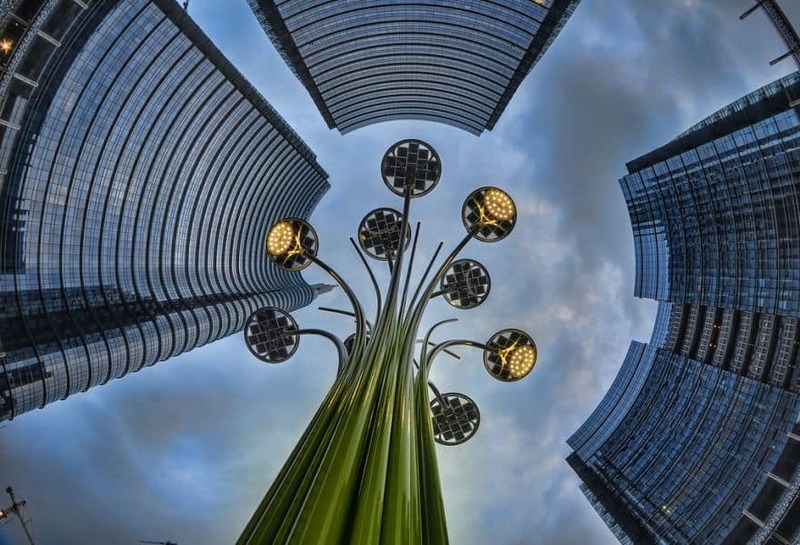 Besides generating electricity for lighting and water technologies, these solar trees also act as vertical gardens, dressed in a living bouquet of climbing flowers, ferns, and epiphytes from around the world. As you can see in this article, solar trees bring more than energy. Around the world, they are transforming communities and improving lives. Use the comment section below to tell us what’s your favorite project.